Biosensors Based On Self-Assembled Monolayers (D.D. Schlereth). Third Generation Biosensors–Integrating Recognition And Transduction In Electrochemical Sensors (U. Wollenberger). Enzyme Biosensors Containing Polymeric Electron Transfer Systems (Hiroko I. Karan). DNA-Based Biosensors (A.M. Oliveira Brett). Bioanalytical Microsystems: Technology And Applications (A.J. Baeumner). New Materials For Biosensors, Biochips And Molecular Bioelectronics (D. Andreescu et al.). Electrochemical Antibody-Based Sensors (J. Rishpon, V. Buchner). Immunoassay: Potentials And Limitations (C. Nistor, J. Emnéus). Non-Affinity Sensing Technology: The Exploitation Of Biocatalytic Events For Environmental Analysis (E. Domínguez, A. Narváez). Biosensors For Bioprocess Monitoring (U. Bilitewski). Coupling Of Microdialysis Sampling With Biosensing Detection Modes (D. Moscone). Biosensors and Modern Biospecific Analytical Techniques further expands the Comprehensive Analytical Chemistry series' coverage of rapid analysis based on advanced technological developments. This 12-chapter volume summarizes the main developments in the biosensors field over the last 10 years. 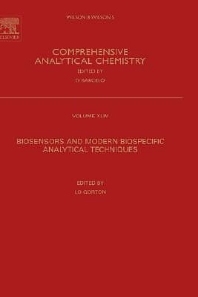 It provides a comprehensive study on the different types of biosensors, including DNA-based, enzymatic, optical, self-assembled monolayers and the third generation of biosensors. As well as many technological developments on bioanalytical microsystems and new materials for biosensors, antibody and immunoassay developments have a prominent place in the book. This book should prove very useful to analytical chemists in academia, research, industry and government and also to postgraduate students following masters courses in analytical chemistry.